SMS Financial & Investment Management is a SEC registered investment advisory firm. Our firm is structured for the sole purpose of providing genuinely independent and objective advice, and offers the same financial products and services available from major financial institutions. Independent means that we are objective and unbiased in helping you select appropriate strategies to meet your goals and dreams. Our firm is committed to excellence in customer service and uncompromising attention to detail as we strive to help you achieve your personal financial goals. We are here to help you build and protect your financial future. 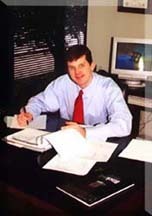 Originally from Claremore, Oklahoma, Steve went on to Oklahoma State University to graduate with a degree in Finance minoring in Accounting and Economics. He gets a lot of his financial wisdom from his Father (owns a Financial Services Company) and Grandfather(Accountant). Steve feels his calling is to assist individuals and families plan for their life, financially speaking. Steve, his wife Chrissy, daughters Lauren and Lindsey, and their son Seth love to be outdoors, take road trips to see our country’s national and state parks, and spend quality time “at the lake”. They are both very active in church activities and Steve plays basketball, softball and flag football on church teams. Go Pokes! !